The most common mix-up is that people believe they are the same. While they're not, I can see how it could be easy to confuse them at a conceptual level. So, let me explain these three terms. For a long time, the common thinking was that the best, most practical passwords consisted of a random combination of upper and lower-case letters, numbers, and a special character or two. If so composed, a password needed to be only eight characters in length. A password today should have a minimum of 12 characters, and ideally, 16 or even more. Continue Reading: How long should a password be? Thinking about ignoring Windows 8 updates, or securing XP in a virtual machine? Is Gmail giving you warnings about other sessions? Does software seem to just keep getting bigger? Find those answers and more in this Answercast from Ask Leo! Isolating other sessions in Gmail can become pretty complex. We'll walk through a number of scenarios. Continue reading: Why do I always have to sign out other sessions in gmail? In and of itself, running XP as a virtual machine doesn't make it any less vulnerable. You can add security by restricting what you do inside a virtual machine to the bare minimum required. 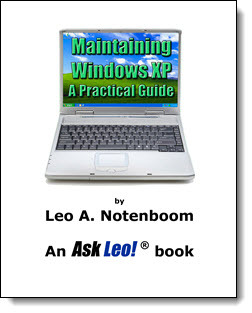 Continue reading: Is running Windows XP in a virtual machine as risky as running XP natively? Continue reading: How do I remove an invalid email address from auto-fill? Continue reading: Why does software only seem to get bigger? There is an easy solution, and a not-so-easy solution. It's going to depend on how much money you want to spend. Continue reading: What email program should I use after Outlook 2003? My belief is that you probably want 8.1. Not for any features per se - but I think you're going to want 8.1 or 8.2 or whatever comes later... someday. Continue reading: Can I ignore Windows 8.1 and stick with Windows 8? Making your XP machine really secure is tough. One point has already been made, limit what is running on it. The general term is called "Hardening" (google it). That means uninstalling anything you do not absolutely need (ie games, printers, ms paint, notepad etc), as well as turning of "Windows Services" you don't need. Another thing you can do is make your "virtual XP machine" read only. Either burn your XP virtual Machine and application to a CD/DVD or put it on a USB drive with a "Write block / lock". That way, even if your current session is infected by something the infection dies when you shut it down (ie shut down FREQUENTLY). Each time you start the virtual machine/application it is from a known good copy that cannot be written to / updated with malware. Be VERY careful when getting Office 2013 download/backup disk. They, the download and the backup disk, are in the version known as "Click to Run" and they will download the updates automatically-woe be to the dial up people. I had this problem and it took me four days of Googling, emailing, and phone talking to get it straight. If possible get the 'MSI' version of the program, it updates fine and gives you the option of what Office 2013 programs to install. I delayed getting new computer since all I heard and read was how horrible windows 8 was. But, finally made the big move, Lenovo with win 8.1 about a month ago. This has taught me to be much more skeptical of various reviewers and opinions. It took me all of 10 minutes to master 8.1 and there are things I really like about it. When i don't like it I am exactly one click from a screen that is nearly identical to Win7. So, if you have been delaying for the same reason I was, don't fear, plan on a very short learning curve...and even if you hate it you're just 1 click away from a windows7-like screen...where you can have a dozen open windows if you like...just like win7. Something I just cannot understand is that people keep blaming the OS developers for not updating hardware drivers and third-party software. That is not their responsibility. Consider all the thousands of items and programs involved (just consider for instance the number of makes/models of printers produced since XP was released). Trying to write the code to make all these work with the new OS would be an overwhelming task. That's why segments of the code is made available to the hardware and software developers. Hardware and software makers had Windows 8 for about a year to update their products. If they did not provide MS with the updates, then MS could not include them in the release. MS does make generic drivers for those items that can use it. However, most items require special manufacture specific drivers or other code. You have items that won't work with Linux, then why don't you complain to those developers about it? It would be just as easy for them to modify their flavor of Linux so these items could work. But then, they're not Microsoft. Hardware/software developers don't want to update their products to work with a new or alternate OS because they - not the OS developer - want you to buy the latest version. After all, they only make money off new sales. If you have hardware/software that won't work with the new OS, then take your anger out on that company. If enough people would put the blame where it belongs and request the hardware/software companies update their code, then maybe something will be done to correct the situation. But to continue to gripe about the OS developer not doing someone else's work doesn't accomplish anything. As you might expect, I hear a lot of questions from many different people. I also hear a lot of different comments, complaints, excuses, and justifications. I also hear a lot of frustration and often helplessness. It's understandable. Computers and technology can be frustrating at times and leave you feeling quite helpless. Heck, that's why Ask Leo! exists. And while many of the different comments, opinions, reactions, and complaints can occasionally leave me feeling frustrated, there's one that really, really bugs me.